“Sustainable development is development that meets the needs of the present without compromising the ability of future generations to meet their own needs”. One important aspect of sustainable development in agriculture is the responsible management of natural resources of which soils and water bodies are the most endangered ones. A major threat for soils are loads with toxic heavy metals applied unintentionally with fertilizers and which accumulate and may pass through soils into ground and surface waters. Any agricultural system where the input of heavy metals exceeds the sum of removal by crops and unavoidable losses to the environment is in fact non-sustainable because it leaves a burden for further generations. One of the most dangerous heavy metals is uranium, because it is not only bio-chemically toxic but also radioactive. Uranium is dispersed in significant amounts for instance via phosphorus fertilizers. Although a lot of uranium research has been done under many viewpoints, the agricultural aspect and its environmental impact has not been paid much attention so far. In this context the “Task Force Sustainable Agriculture (TFSA)” of the Agenda 21 for the Baltic Sea Region (BALTIC21) has organized a series of symposia entitled “Protecting Water Bodies from Negative Impacts of Agriculture”. Commissioned by the Federal Minister of Food, Agriculture and Consumer Protection and encouraged by her Scientific Advisory Board on Fertilizer Issues, the Federal Environment Agency Soil Protection Commission (KBU) and the Federal Institute for Risk Assessment (BFR), the former Institute of Plant Nutrition and Soil Science (PB) of the Federal Agricultural Research Centre (FAL) in Braunschweig (from 01.01.2008 on “Institute for Crop and Soil Science, Federal Research Centre for Cultivated Plants, Julius Kühn-Institut (JKI)”) and TFSA conducted under this general headline from June 4-6, 2007 the symposium “Loads and Fate of Fertilizer-derived Uranium”. The symposium brought together the world’s leading scientists on the subject. The papers of the symposium are compiled in this book and have been peer-reviewed. 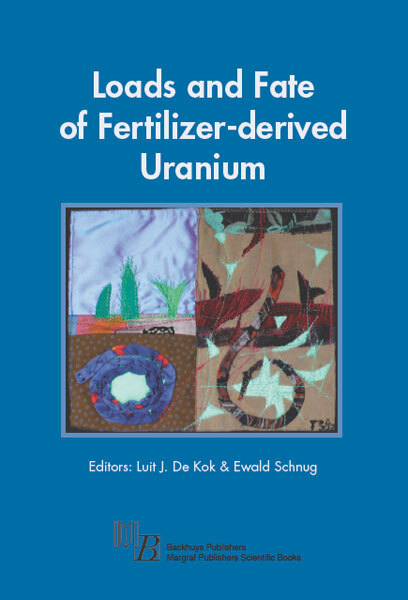 They present the most recent and comprehensive collection of data and references on agricultural matters related to uranium. It provides a solid base of scientific information for responsible decisionmaking in agricultural politics towards sustainable development in agriculture.